2007-Debuted on a track as a featured guest. Created lots of buzz in the industry. They came out of nowhere. Ruthless. Can’t wait for their first LP next year. 2008-Released first full official album. Instant classic. Everyone has these songs memorized. Our grandchildren will be listening to this. They are so hungry, they cannot be stopped. Dope beats, fly rhymes, you couldn’t ask for more. 2009-Released second album. Not quite as good as the first, but still dope as hell. Better than almost everyone else’s stuff. 2010-3rd album is decent. Has a few really good songs on it, but some misses also. They changed their style for some reason and I’m not sure that it’s better. They can’t all be classics, right? 2011-4th album. I hate to say it, but it’s disappointing. Still one of my favorite acts, but this one won’t get too many plays. I was really excited for this. Were they even trying? Lazy, where’s the passion? Next one will be better for sure (I hope). 2012-WTPh?? These dudes used to be hungry! Remember their first album? That was my jam! I guess these guys just don’t care anymore, they made their money. Ugh. So disappointing. These beats are corny. They’re too busy worrying about their acting careers to focus on their real job. Looks like they fell off. For the record, I think the Phillies will be fine. Mostly because of their pitching and that the rest of the division isn’t as good as they seemed initially. Plus, the Phillies played so poorly and are still .500. What’s going to happen when they actually play well? 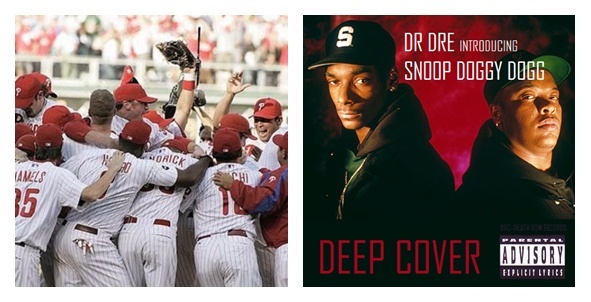 This entry was posted in The Phillies and tagged De La Soul, Dr. Dre, fell off, Hammer, hip hop, hungry, Nas, Phillies, Snoop, steady decline, Wu-Tang, Xzibit. Bookmark the permalink.